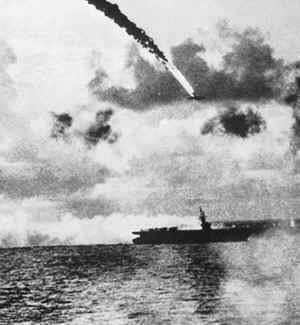 The next stage in the American campaign was an attack on the Marianas, which was scheduled for June 1944. The Northern Attack Force, led by Vice-Admiral Richmond Turner, was assembled at Hawaii in readiness to attack Saipan. The Southern Attack Force, commanded by Rear-Admiral R L Conolly assembled at Guadalcanal and Tulagi in preparation for an attack on Guam. There were 71,000 assault troops in the Northern Force and 56,000 in the Southern; a combined total of 127,000.In November 1943, America launched the start of a major assault through the Central Pacific and at the heart of the Japanese defence system. This started with the assault on the Gilbert Islands and moved, in February 1944, to the main atolls of the Marshall Islands. The ferocity of the American attack forced the Japanese to move their fleet to Singapore. As the Americans moved relentlessly east through the Central Pacific, the Japanese came to the conclusion that only a major sea battle with America would redress the balance at sea. Without control of the sea, the Japanese believed, the Americans could no longer maintain their advance as all their successes had been amphibious based. Without control of the sea, the Americans could not longer move her troops to shore.